Trampolines can be a terrific, fun way to exercise. As a kid, you may have spent many hours bouncing on an outdoor trampoline—or possibly on your bed. Good news: you don’t have to be a kid to enjoy the cardiovascular benefits a trampoline can provide. We’ve reviewed the best trampolines, so read on to discover the safest, smartest choices for you and your kids. The best general trampoline that offers a good source of exercise for kids and adults alike. If you're concerned about keeping your kids safe, then check out the Zupapa. If you're an adult looking to incorporate rebound training into your workouts, then try this trampoline. If you want a high-quality, large, and safe outdoor trampoline, then this is one of the easiest to assemble quickly. Extra-active adults and kids alike can burn off some energy with a greater bounce on this long-lasting trampoline. The exercise trainer is the perfect shape and size for a home gym. It’s designed for adult workouts more than anything else. Offers plenty of safety features to keep kids secure while in use; all are tested by the ATSM. Zupapa’s trampolines go through extensive safety and quality testing in Germany. They also come with one of the higher enclosure nets. The folding frame is easy for one person to use in a home gym. Simply fold it up and put it away when you're done exercising. It comes with plenty of high-quality safety features and top-end durable materials. Assembly takes less time than many other trampolines. The large, rectangular trampoline offers a lot of durability and bounce for intense play or exercise. The trampoline's shape is convenient for smaller spaces. The frame folds up for extra portability and storage. The weight limit is low, and the construction is slightly lightweight compared to other options. There have been complaints about durability—which the company is attempting to address. It also can be difficult to assemble. The one-person-size trampoline is very small and has very few safety features for smaller children. Even with the easy-to-use push pins, it’ll still take two people to assemble. There are no special accessories like basketball hoops. The extra features and size come with a higher price tag and a more complicated assembly. It’s not the most durable frame available. There aren't a ton of safety features to make it secure and friendly for children. Boost the weight loss. It should come as no surprise, but trampolines get the heart pumping. Jumping on a trampoline is a great way to lose some extra weight. Build up a sweat without making the whole thing feel like work. Build stronger bones and muscles. Extra resistance, just like milk, does the body good. Using a trampoline can help strengthen bones and muscles, especially in the lower body parts like the legs. Increase oxygen circulation. In addition to helping your heart and lungs, jumping on a trampoline helps to increase your body’s overall circulation. That means you will feel the benefits in your stamina, no matter what the activity. Take it easy on the joints. Compared to other exercise equipment, the jump mat on a trampoline softens the impact of workouts. This helps to protect joints like your knees from the wear and tear common with many forms of exercise. Outdoor trampolines are very popular with kids because they generate a big bounce. Outdoor models often include a safety enclosure to keep kids from falling off or getting stuck between the jumping mat and springs. The best-netted trampolines connect the net inside the safety padding, so there’s no gap. Flexible, tall, padded poles, often concavely bent away from the jumpers, are also important to hold the net up. Indoor trampolines tend to be smaller (since they have to fit into smaller, tighter spaces) and are more common for kids’ fitness. You can often find small indoor trampolines at the local gym since they provide a low-impact workout as well. Indoor trampolines are a great addition to any home gym if you want to vary your workout routine with a fun piece of equipment. Need to take a small trampoline with you? While portability isn’t common, some models are small enough to get the job done with the right features. Foldable trampolines are typically smaller and use bands instead of springs. When you’ve finished exercising, you can simply fold it up, detach the legs, and store it away. Springless trampolines use a system of flexible rods with the frame underneath the jumping mat, which eliminates any potential of kids getting caught in the springs. These trampolines enhance safety but are more expensive than other types. 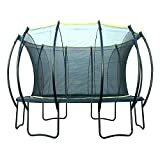 There are also springless trampolines that use cords or bands to connect the jumping surface to the frame. These are most often small indoor trampolines. Skywalker is one of the most popular brands since they combine functionality, safety, and affordability. All of the Skywalker trampolines meet or exceed ASTM safety standards. They all use a safety net inside of the safety pads. Their most popular model is the 15-foot round trampoline. Alley Oop, the maker of the popular VariableBounce Trampoline, is a line sold by Jumpsport—which also sells its own lower-end trampolines. The brand has proprietary high-bounce springs. Most of the trampolines use padded rods along the net on the outside of the springs. Springfree trampolines are growing in popularity due to their innovative safety features. Instead of springs, they use flexible rods underneath the frame. This allows the soft edge of the jumping mat to merge with the netting. The enclosure is also made of flexible netting that gives a bit when bouncing. One of their bestsellers is the Oval Round Trampoline. Zupapa, based in Germany, offers a line of trampolines that all have gone through an inspection process for quality, durability, and safety. Although Zupapa is fairly new to the trampoline business, options like their TUV-Approved Trampolines have become popular due to their affordability and safety features. $250 and under: The budget range of trampolines where smaller options are plentiful. Indoor and portable trampolines are common here. Accessories are often lacking. $250-$750: The price range where most common trampolines can be found. Better safety features, like padded springs and net enclosures, and more accessories are common. $1000 and above: High-end trampolines with around 18-foot diameters fill out this range. 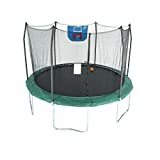 Rectangular trampolines, being more expensive than round models, are also common here. The frame and jumping springs typically use a combination of stainless and galvanized steel. While the frame can last up to ten years, the springs may last only two years before needing a replacement. Many companies offer one- or two-year warranties. Most jumping mats are made of polyethylene or nylon and are designed to last three to eight years. Depending on the shape and size of the trampoline, the feel of the mat will vary between different models. The fibers are closely woven together to offer enough resistance for a healthy bounce. Many outdoor trampolines now have nets or enclosures for added safety. How the net and jump mat connect to the poles and padding is important since gaps between the connections can be dangerous. Gapless designs, often using alternatives to springs like rods, offer the safest design for a higher price. The design of the trampoline: Some of the best trampoline manufacturers have redesigned their models to make them much safer in recent years. For the safest trampoline options, look for brands that use concave rods, padded springs, and no-gap jump mats instead of traditional designs that lack extra padding or enclosures. The shape of the trampoline: The overall footprint of the trampoline will influence your jumping experience. Round and oval trampolines are the most common, offering a great feel that kids can enjoy. Square and rectangular trampolines, on the other hand, are more common for exercise and gymnastics where greater resistance is required. The size of the jumping surface: A trampoline needs to fit into space you have available. Most outdoor trampolines require a lot of space since they tend to be around 10 to 18 feet in diameter. Indoor options, on the other hand, are typically just a few feet wide to fit into tighter spaces. Skywalker trampolines are generally considered one of the best trampoline brands because of their combination of safety, quality, and cost. This trampoline is one of their most popular models. The Jump N’ Dunk comes equipped with a basketball hoop attached by Velcro, so it’ll simply tear away without breaking the net or frame if kids are too rough. All Skywalker trampolines are tested by the American Society for Testing and Materials. The net is supported by padded poles without a gap between the jumping mat and the safety padding. The frame is also reinforced. At just 200 pounds, the maximum weight limit is relatively low, which means it might not be ideal for some adults. The trampoline is also fairly lightweight, which can make it easy to knock over or blow away in the wind if placed outside. Based in Germany, all of Zupapa’s trampolines meet extensive safety regulations. The “TUV” in the Zupapa TUV Trampoline means it was inspected and approved by German technical inspectors for quality, durability, and safety. The net on this trampoline is inside the safety pad and is higher than many comparable outdoor trampolines. The weight limit is also high at 330 pounds. Extras like a ladder and a rain cover are also included, saving you more money. Although Zupapa trampolines are some of the safest available, the poles are straight, which puts them closer to the sides of the net. Assembly is relatively easy but can take up to three hours. The manual can be hard to understand too. Look for step-by-step videos online instead if necessary. The SkyBound Stratos Trampoline is one of the most popular trampolines because of its high-quality build and well-thought-out safety features. The safety net uses concave poles to keep it stable, making it nearly impossible to jump outside the net. It’s also UV-resistant to protect the exterior of the trampoline from sun damage. The trampoline is well built with a stainless-steel frame and rust-resistant parts. The weight capacity goes up to 330 pounds, which makes it good for adults as well as kids. Finally, it comes with an easy-installation system using push pins. No bolts required. All of that quality isn’t cheap. While the set up is fairly easy, you’ll likely need two people to get it assembled. As well, you’ll need to get the net lined up completely to take advantage of all of the safety features. Plus, there are no special play accessories, such as basketball hoops, available. Rectangular trampolines are known for offering more bounce compared to traditional options. The Upper Bounce Easy Assemble Trampoline is no exception and provides plenty of room and height for jumpers. The mat has eight-row stitching to prevent tearing, and the net enclosure also has reinforced edges for extra durability. The best part is safety. The net has no gap between the mat and the safety pads and runs through an upper ring for extra support. Plus, all of the materials are highly durable and UV/water resistant. The maximum weight is also very high at 500 pounds. Rectangular trampolines often come with a higher price tag because of the complicated construction and greater amount of materials. Once again, the Upper Bounce is no exception. It can also be a little confusing to assemble, taking more time and patience to complete. The Stamina Folding Trampoline is ideal if you want to use a trampoline in your training without taking up a lot of space. The small trampoline uses a band-tension resistance system instead of typical springs. It’s designed for rebound training to get a workout in without stressing your joints. The system also provides some strength-building benefits. When you’re not using the trampoline, fold it up and put it away. The folding frame is fairly sturdy but requires extra set up. After you unfold it, you’ll want to double-check that everything is snapped into place before you start using the trampoline. There’s no safety net, which increases the risk of injury and makes it unsuitable for kids. At 36 inches in diameter, it’s also pretty small—this is both a pro and a con. You can use it in any room, but it’s really only suitable for one person at a time. Trampolines don’t have to just be for kids! You can also use an indoor trampoline for cardio exercise, so you can burn calories without overstressing your joints. 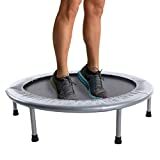 The Marcy Trampoline Cardio Trainer is designed for a home gym and is just 40 inches across. It also folds away for easy storage. The trampoline comes with a handrail for safety, so you won’t fall or trip. There’s also a protective cover around the edge that hides the straps used to create the bounce. The trainer doesn’t offer the most durable construction. Its lightweight build is also a problem when things start to wear out after too much jumping or if you pull on the handlebar too hard. There are minimal safety features and no safety net. Children should never jump on trampolines without adult supervision. Even with net enclosures, it’s important to keep things safe with a watchful eye on younger jumpers and large groups of people. For smaller trampolines, keep the number of people jumping at the same time down. Ideally, only one person should use the trampoline at any given moment. Unless it’s time for gymnastics practice, tricks on regular, round trampolines can be unpredictable. Kids and adults shouldn’t be doing somersaults or flips since these risky behaviors can lead to the most serious injuries. Q: What’s the biggest trampoline you can buy? A: Most outdoor trampolines come in 10-, 12-, and 15-foot versions, but the biggest you can purchase are 20 or 24 feet in diameter. Q: How much weight can a trampoline hold? A: On average, large outdoor trampolines have a weight limit of 200-300 pounds. Bigger, sturdier models can hold more; some heavy-duty options can even hold 400-800 pounds. Q: How long do trampolines last? A: The jumping mat on a trampoline has an average lifespan of three to eight years. The springs, pads, and netting typically last about two years. The more weatherproof your trampoline is, the longer it will last. Q: How long does it take to set up a trampoline? A: It depends on the trampoline you buy. The easiest ones to assemble take less than an hour. More complicated trampolines can take up to three or four hours to assemble all of the parts. Q: Is it okay to leave a trampoline out in winter weather? A: Many trampolines are designed to be left outside. You can take off the pads and store them away to keep them from getting wet from rain or snow. You’ll want to sweep the snow off the jumping mat to prevent it from building up and stretching out the springs. 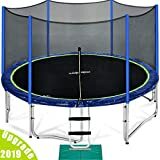 When it comes to trampolines, whether for adult exercise or for kids’ enjoyment, this piece of exercise equipment is a great workout and experience. If you’re willing to splurge for the best, the Skywalker Trampolines Jump N’ Dunk offers top-end safety features and a high-quality build. If this one is a little rich for your blood, the Stamina Folding Trampoline is a great budget-friendly option as well. Which options do you prefer? Tell us in the comments!